Years ago when my son was rather young I would take him to Farleigh Dickinson University’s Madison, New Jersey campus to watch the New York Giants pre-season training camp. I told him that any words that he would hear that his mother might not approve of were to be forgotten and never repeated, at least not in her presence. As an avid Giants fan going back to the glory days of Charley Conerly, Frank Gifford, Sam Huff, and Andy Robustelli I took great pleasure in sharing my passion for “Big Blue.” During one of our visits the Giants coach, Bill Parcells was especially sarcastic in his own inimitable fashion as he joked with the likes of Lawrence Taylor, Phil Simms, and Mark Bavaro. The expletives flowed, but what we witnessed was the work of a master motivator who, despite some unorthodox methods, knew how to get the best out of his players. I am avid follower of sports, but I like to look at it from a historical perspective. Many sports books, particularly, biographies come down to hagiography and statistics, which I find unacceptable. The new biography, PARCELLS: A FOOTBALL LIFE by Bill Parcells and Nunyo Demasio is an interesting blend of football statistics, but also an in depth study of one of football’s greatest coaches. We see a man with all of his foibles apart from his successes, in addition to his large ego, but also a strong sense of contrition as his life evolved. Charles Parcells, Bill’s father was a northern New Jersey sports legend who was a loving father, but a strict task master. His mother, Ida was a traditional Italian woman who maintained a warm home, and usually contained her forceful personality. Bill was more of a baseball player than a football player during his youth, but he would grow interested in the sport as it was seen as a ticket into college. He was a lineman/linebacker at Wichita State University and was even drafted by the Detroit Lions. While in college he met his wife Judy and by the time he obtained his first job, at Hastings College in Nebraska, they had a daughter and another child on the way. Parcells coaching career would keep him out of the state he loved, New Jersey, for almost twenty years. His career path as an assistant coach would take him back to Wichita State, to West Point, Florida State, Vanderbilt, Texas Tech, Air Force, the New York Giants, and the New England Patriots. Along the way he met and grew close with a number of mentors that included; Bobby Knight, the irascible basketball coach, and Al Davis, a Brooklynite to the core and long time owner and coach of the Oakland Raiders. Throughout his journey before he became a head coach Parcells, who possessed his own rather large ego, was willing to learn from others and adapt if it would contribute to making him a better coach and improve his players. Finally, he would achieve his goal of being a head coach, being hired by the New York Giants in 1983. When Parcells arrived he found the likes of Lawrence Taylor, Harry Carson, and a quarterback named Phil Simms who as yet had not found himself on hand. For me the Parcells era with the Giants was wonderful. With visits to training camp I felt I had a special relationship with the team. Parcells banter at press conferences reflected a moody, sarcastic, but sincere individual. He drove his coaches and players to distraction to the point that Simms came into his office at one point and demanded that he be traded. The book does a superb job describing Parcells coaching methods and philosophy, particularly how he interacted with the players on a number of levels. For example, he was quite aware that a number of players had drug issues especially Lawrence Taylor. Parcells worked with these players to overcome their problems, set up a team drug policy at a time the NFL did not have one, and a vast majority of players who worked under Parcells state that the most important thing he did for them was make them into men and accomplish things they thought they would never be able to achieve. In January, 1987 the Giants won their first Super Bowl under Parcells, a game that has special meaning for me as I was in Brussels that weekend accompanying twenty high school students on a Model United Nations competition at the Hague. When I arrived the first thing I asked the attendant at the hotel desk was where I could watch the game. I was told 150 miles from the city (I think he thought I was referring to soccer!). Distraught, I called the American Embassy and explained my predicament. The desk sergeant was from Long Island and he agreed to send transportation for myself and my students to NATO Support Headquarters to watch the game with American troops if I promised to send him a VCR copy of the game when I returned home. A deal was struck; we convoyed to Headquarters and watched the game with American troops until 4:00 am. I was never prouder to be an American and a Giants fan when they beat Denver 39-20. The list of coaches that Parcells trained is remarkable and many became successful head coaches in their own right. After leaving New England Parcells wound up back in New Jersey with the New York Jets where he was successful once again in turning around another franchise. After the death of its owner Leon Hess, who Parcells worked with well, he moved on to the Dallas Cowboys after a stint as an analyst on ESPN. With the bombastic Jerry Jones, the owner of the Cowboys we see a mellower Parcells in dealing with ownership, but the same overbearing approach on the field. Following his stay in Dallas, Parcells concluded his career in the front office of the Miami Dolphins. The book delves a great deal into Parcells private life. His meandering career played havoc with his 40 year marriage which collapsed due to his infidelity. In addition, he was an absentee father to his three children as he became more of a parent to his players. We witness a man who faces his mortality with intricate heart surgery. Lastly, we are exposed to Parcells inner thoughts as he reviews his life decisions and takes the blame for many of mistakes he has made. To Parcells’ credit he did try and right many of the wrongs he felt guilty about as he made peace with certain colleagues and apologies to family members. 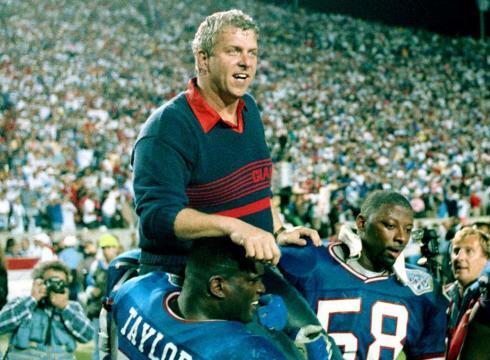 However, no matter what we think of Bill Parcells as a person, no one can minimize the impact he had and how integral he was to the history of the NFL during his long tenure. To his credit he fathered an amazing coaching tree that includes the like of Bill Belichick, Sean Peyton, and Tom Coughlin, between them there are six super bowl rings. Some would argue that Parcells receives too much credit for his success and that his legacy should be that of a “franchise hopping, Hamlet like resignations” dominating. Having watched Parcells since 1980, I believe that this biography is mostly objective and if you want to enjoy a stroll down memory lane and relive many of the NFL highlights of the last forty years you should pick up a copy of PARCELLS: A FOOTBALL LIFE.